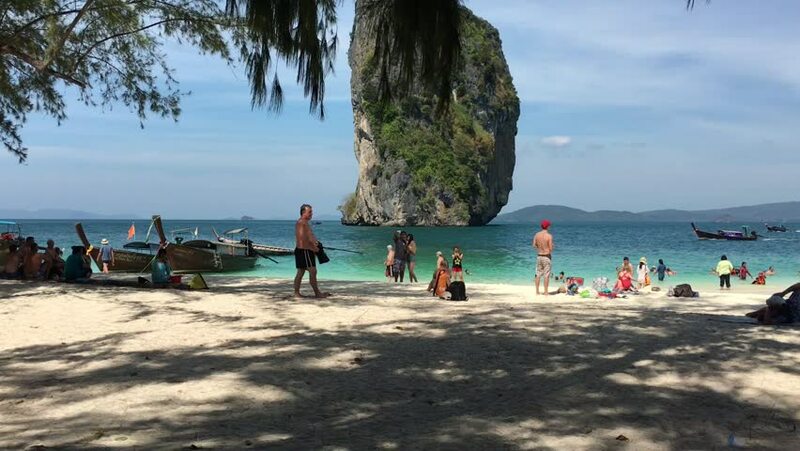 KRABI, THAILAND - 10 JAN 2016 : A lot of tourist are relaxing on the beach at Poda island on Jan 10, 2016 at Krabi, Thailand. hd00:32Raya Island, Phuket - march 15: People enjoying the surf and sand beach at Raya Island on march 16, 2014 in Phuket, Thailand.Raya Island is a popular day trip destination off the east coast of Phuket. hd00:06Hambantota, Sri Lanka, November 10 2013, Sri Lankan fishermen catch fish in the ocean, the local flavor. 4k00:17Sabah, Malaysia - 8 September 2018. Group of tourist having fun at Manukan island beach with taking pictures. 4k00:26phi phi island, thailand - 30 january 2019. tourist at phi phi island enjoying the beach on sunny day tropical weather. hd00:13BODRUM, TURKEY - 3 August 2012: Tourists swim in the sea and sunbathe on the beach and pier on a warm sunny day. 3 August 2012 - Bodrum, Istanbul. hd00:23RIO DE JANEIRO - MARCH 19, 2016: Workers from the municipal COMLURB maintenance company clean Copacabana Beach before the morning crowds.